Definition - What does Dandayamana Dhanurasana mean? Dandayamana dhanurasana is an advanced variation standing balance that incorporates a backbend. The name is derived from the Sanskrit danda, meaning "stick" or "staff," dhanura, meaning "bow" and asana, meaning "pose." It is included in the Bikram yoga sequence of 26 postures, and promotes both mental and physical benefits. The English name for dandayamana dhanurasana is standing bow pose or standing bow pulling pose. Although the physical advantages of this posture are often emphasized, the mental and emotional benefits are profound. Balancing and holding the pose requires strength and helps to build determination, focus and patience. It has the potential to teach the yogi balance in all that he/she does, on and off the mat. It is said that because dandayamana dhanurasana is an expressive posture, it can release emotional stress from the tissues of the body. It may help yogis let go of shame and fears of betrayal or abandonment. It is an asana where one can feel strong and proud, yet vulnerable and open. 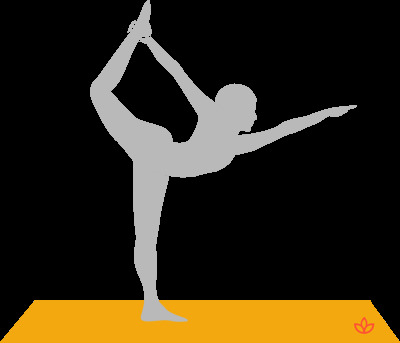 Dandayamana dhanurasana is associated with opening the anahata (heart) chakra. The chest stretches and opens, increasing the flow of prana to this fourth chakra and helping the yogi feel more open, loving and connected with all beings.